The Unlikely Pilgrimage of Harold Fry is one of the few books which have made it onto my 5 star list. It was the bookish equivalent of a bowl of rice pudding with a dollop of really tangy jam - immensely comforting, not many surprises, but with a definite punch which made the whole thing come alive. Plus it made me cry, and any book which does that deserves a high mark. In all honesty I was a bit apprehensive to learn of this book, The Love Song of Miss Queenie Hennessy. Harold Fry was such a massive success - not only commercially: it was also longlisted for the Booker - I feared this would be a cynical tie-in, or an attempt to exploit the great affection readers have for Joyce's debut. It isn't. This book stands as a companion novel to Harold Fry and it does so marvellously. It begins with a letter - the letter Harold Fry receives which prompts him into his pilgrimage - and its reply, the one Harold scribbles the note onto to tell Queenie to wait for him. Which she does. Love Song is Queenie's longer letter to Harold, her confession and attempt at atonement. It is the things she needs him to know in case he doesn't get there in time. It is what happened during her time at the factory, during the car rides, and why she acted as she did back then. This story is interspersed with the day-to-day life of the hospice - the nuns, the other patients. Joyce has a rare skill for the ridiculous, and for balancing it against heart-wrenching truths. There is great sadness in this book, but it is genuinely funny too and filled with joyous moments. Yet, it is lacking. There is a story to be told here but at the same time it's rather too dependent on Harold Fry, relegating it to a top-notch curio rather than a must-read. The premise of Harold Fry was always contrived but Joyce handled it with enough skill and compassion to make it work; Love Song doesn't work in that way. Harold's walk and Queenie's desire to wait for him don't make enough sense when this book is treated in isolation. There is also the problem of Queenie herself. Harold Fry was never about her, she was simply a name, a memory; she was an icon through which Harold and Maureen found peace. She did nothing beyond exist, which was fine within the confines of that story but here she is a woman in love with a married man. She has spent her life loving him and I do not find that romantic, I find it hateful. I bring my own baggage to this in the form of a psycho hose-beast who declared herself in love with a man she'd never met, who caused cataclysmic damage to two vulnerable people, and who is - above and beyond all else - a pathetic coward who needs to get a grip and live in the world which is in front of her, not the fantasies of her own head. So, yeah, every time Queenie recounted how much she loved Harold and how she'd spent her life alone, I wanted to reach for my trusty slap-haddock. I like to image hitting people I don't like with fish. Judge me if you wish. Joyce, it should be emphasised, does a sterling job with Queenie. As much as I disliked the abstract concept, and as much as I hated the emphasis on her love for Harold - Harold Fry was never a love story - I did enjoy this book. From an outside perspective I think it's tremendously faulty; while there's certainly a story to be told here I do feel it's a little hamstrung by its own set-up. Compare Queenie to Penelope (Greek lady; liked weaving) to show the missed potential. There's no getting away from the fact this is 368 pages of a woman writing about a bloke she's been secretly in love with for decades. When the great confession comes, it felt absolutely perfect for this self-obsessed character, Queenie again taking ownership of something which isn't hers, but it's disguised as a Romantic gesture and that is disappointing. It's written to be felt, but for me it was Queenie making things about Queenie. Shyness is arrogance in disguise. It is fair to mention, especially because I have railed on plenty of books in the past for the issue, that I frown upon its narrative concept (if that's the correct term). This presents itself as a character-written text. Queenie is writing her story in shorthand, desperate to get this tale down before it's too late yet it is very writerly. I bang on about how if something is X it has to BE X; Queenie Hennessey does not read like the product of somebody writing in shorthand, worrying about whether she has enough time left. It doesn't inhibit the enjoyment of the book but it would be hypocritical of me not to mention it. If you loved The Unlikely Pilgrimage of Harold Fry as much as I did, I'd definitely recommend picking this one up. If you haven't read either, start with that; Love Song has significantly less to offer the uninitiated and will demand they suspend their disbelief rather too much to get into it. 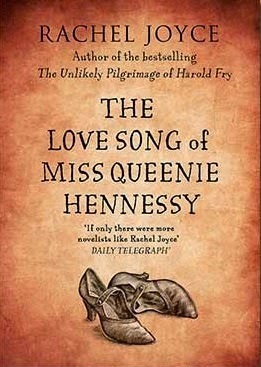 The Love Song of Miss Queenie Hennessy a bittersweet, hilarious and heartfelt book full of terrific characters and despite my personal baggage, I enjoyed it hugely.